Maybe you’ve watched wildlife at the zoo or on the Discovery Channel and during some particularly anthropomorphic moment thought to yourself: Wow, they really aren’t so different from us. Steven Wise, a lawyer who’s spent an entire career on animal rights cases, has such thoughts constantly. 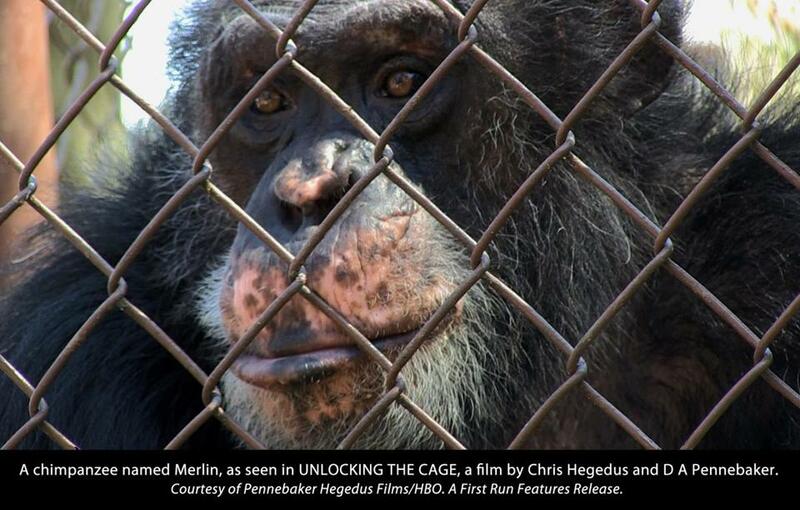 Wise’s passion drives the documentary “Unlocking the Cage,” a chronicle of his quest to have the courts recognize chimpanzees as “persons” with legal protections. The argument isn’t as, well, wild as it might sound. Documentarians Chris Hegedus and D.A. Pennebaker (“The War Room”) initially spend time around Wise’s home in Florida, where the busily rumpled attorney holds forth on the cognitive complexity of apes, elephants, and cetaceans. (Wise also has Boston ties, as shown in Harvard lecture footage and an old headline about a zoning case involving a Somerville kennel.) “When you imprison a chimpanzee, the chimpanzee understands that tomorrow he’s going to be in prison [too],” he laments. The contrast between the animals’ circumstances and earlier, naturalistic scenes of Florida’s rambling Save the Chimps sanctuary is striking, even if the documentation could be stronger at points. Details are scarce on those university subjects, whose use in a locomotion study hardly sounds like cosmetics testing. Still, Hegedus and Pennebaker do solid work presenting Wise’s arguments. It’s a tricky narrative challenge to shift from inherently compelling wildlife scenes to abstract courtroom debate, but the film manages it capably, even spicing things up with one justice’s admonition that Wise needs to cut his slavery analogies. And we do get the requisite “Planet of the Apes” clip of Charlton Heston howling, “It’s a madhouse!” Even if Wise’s position isn’t so mad. Directed by Chris Hegedus and D.A. Pennebaker. At Coolidge Corner. 91 minutes. Unrated (images of cruelty to animals, language).